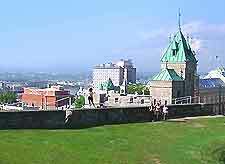 Quebec City is surrounded by ancient fortifications, which give the city a true historic appeal. The many landmarks and monuments in Quebec City have resulted in the city being accredited as a prestigious UNESCO World Heritage Site. 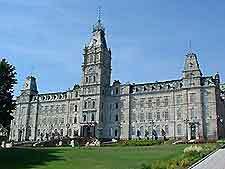 Some of the main landmarks and monuments in Quebec City include the 19th-century Parliament Buildings, the Place Royal and the Quebec Citadel. 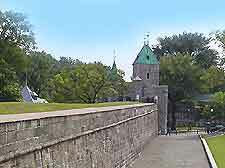 An integral part of Old Quebec, the Fortifications of Quebec, a National Historic Site, are extremely old and were originally built in the early 1600s, as a wall around the city. Consisting of around 5 km / 8 miles of stone walls with nearby walking trails, guided tours of this unique landmark provide a real insight into the city's rich heritage. An interpretation center is also available en route, full of interesting information about the Fortifications of Quebec. One of the most notable landmarks in the whole of Quebec City, the Parliament Buildings lie in the St. Jean Baptiste district and are surrounded by landscaped gardens. Dating back to the late 19th century, the Parliament Buildings are an important center of politics and still very much in use today. With impressive architecture and many well-preserved period features, regular guided tours of the interior are available. Dating back to the beginning of the 17th century, Quebec City's Place Royale is one of Canada's most precious and historic landmarks. 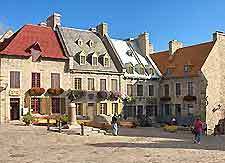 Comprising a number of buildings and streets, the Place Royale is an important area of Old Quebec, where you will find a host of restaurants, coffee shops and places to visit, most of which are full of character and steeped in history. 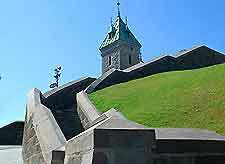 With impressive views of the St. Lawrence River, the Quebec Citadel houses a wealth of military memorabilia and history. Highlights here include guided tours, a museum area, and regular changing of the guards ceremonies during the summer months. 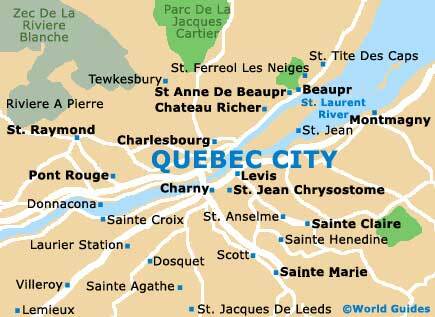 The Quebec Citadel is also often referred to locally as the 'Gibraltar of America'. A beautiful religious building, the St. Anne de Beaupré Basilica is an outstanding Roman Catholic chapel, built more than 350 years ago. Situated on the eastern side of Quebec City, the St. Anne de Beaupré Basilica is known for its stone statue of Sainte Anne and is the center of many important religious events throughout the year.